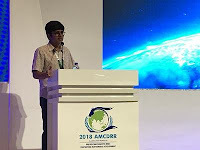 Asian Ministerial Conferences on Disaster Risk Reduction (AMCDRR) is a regional platform in Asia aimed at creating, sustaining and strengthening shared political commitments towards DRR in the region. A biennial conference, it has been jointly organised by different Asian countries and the United Nations Office for Disaster Risk Reduction (UNISDR) since 2005. Disasters, more often than not, affect communities separated by political boundaries. This means that the efforts of nations towards disaster risk reduction are connected with as well as inter-dependent on each other. This spirit of interconnectedness and cooperation have remained a constant theme in the global frameworks for DRR with the Hyogo Framework for Action (HFA 2005-2015) and its successor, the Sendai Framework (2015-2030), vouching for it. One platform to further this spirit of cooperation is the Asian Ministerial Conference on Disaster Risk Reduction (AMCDRR). The second AMCDRR after the SFDRR was held from July 3-6, 2018 at Ulaanbaatar in Mongolia. Its theme was ‘Preventing Disaster Risk: Protecting Sustainable Development’. Disaster Risk Reduction is critical to achieving the Sustainable Development Goals, as highlighted in the 2030 Agenda for Sustainable Development. 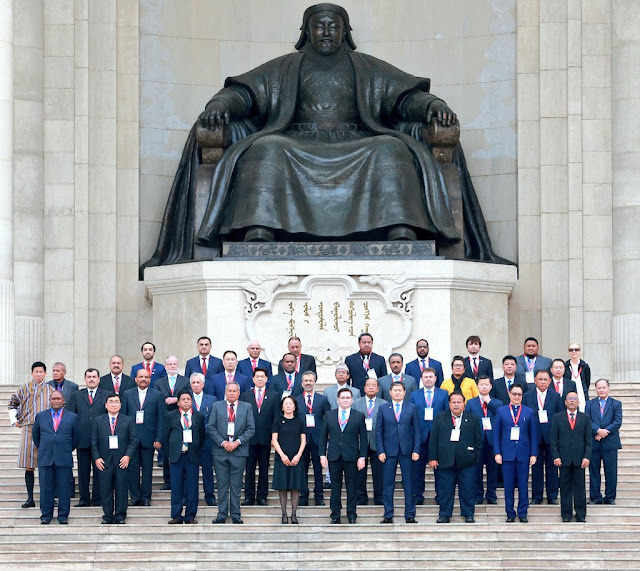 To discuss the roadmap for action towards the same in the Asian region, the Conference brought together more than 3,500 people from over 1,500 organisations, including representatives from more than 50 countries. A high-level Indian delegation, led by Shri Kiren Rijiju, Minister of State, Home Affairs, participated in the Conference. Presenting the country statement, Shri Rijiju reaffirmed India's commitment and support towards implementation of the SFDRR and the Asia Regional Plan. He said India believes in working together with other with countries, learning from their experiences and sharing its experiences on DRR. The Minister also highlighted the need to ensure that new infrastructure should be resilient to disaster, and urged governments to make it an integral part of their national budgeting process. He also underlined the need to systemise data and setting up national disaster databases. Dr. P. K. Mishra, Additional Principal Secretary to the Prime Minister, co-led a discussion on 'Strengthening Disaster Resilient Infrastructure and Urban Resilience'. He emphasised that to achieve the loss reduction targets enshrined in the SFDRR, mainstreaming of DRR in development is a must. Citing the annual meeting on the Asian Infrastructure Investment Bank (AIIB) held in Mumbai in June this year, he highlighted that Asia's appetite for investment in infrastructure is growing, and it was important that this investment is made in a manner that it is safe from disasters. While disaster resilient infrastructure calls for huge investments, there are certain areas where tangible results can be achieved with advanced planning and preparedness, and very little investment. 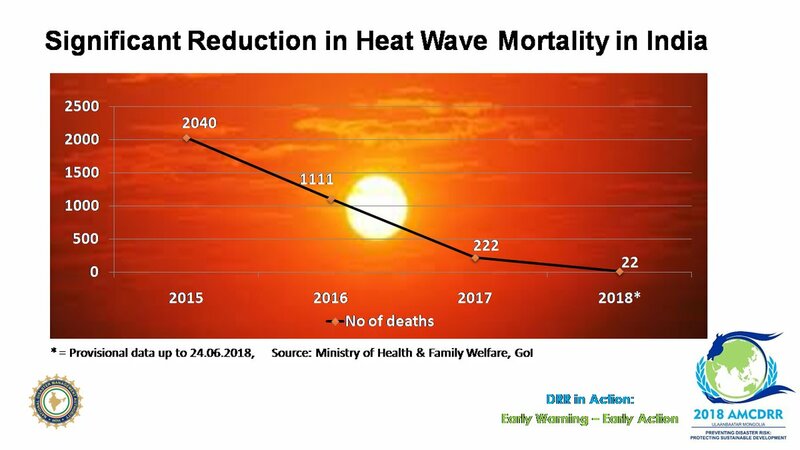 A significant reduction in heat-related deaths is one such success story from India. The story was narrated by Shri R. K. Jain, Member, National Disaster Management Authority (NDMA), during the thematic event on Early Warning and Early Action. 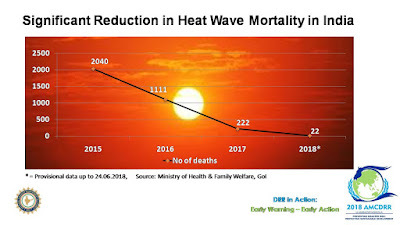 Effective implementation of the NDMA Guidelines on Prevention and Management of Heat Waves by heat-prone States, timely and accurate early warning and its wide dissemination, regular follow-up and monitoring, and extensive awareness generation campaigns in local languages across various media have been able to reduce the risks. The numbers speak for themselves - from more than 2,000 heat related deaths in 2015, the numbers this year have come down to 22 (as per numbers reported by States till June 2018). Focusing the spotlight on preserving cultural heritage - something that defines a people's identity - the Government of India in collaboration with the International Council for Monuments and Sites (ICOMOS) led a special session on 'Cultural Heritage and Disaster Risk Management (DRM)' that brought together leading experts from India, Indonesia, Myanmar, Nepal, Japan, Turkey and Thailand to discuss challenges in protecting cultural heritage from disasters. It served as a platform to share good practices on strengthening resilience of cultural heritage sites and museums through engagement of stakeholders, including local communities. 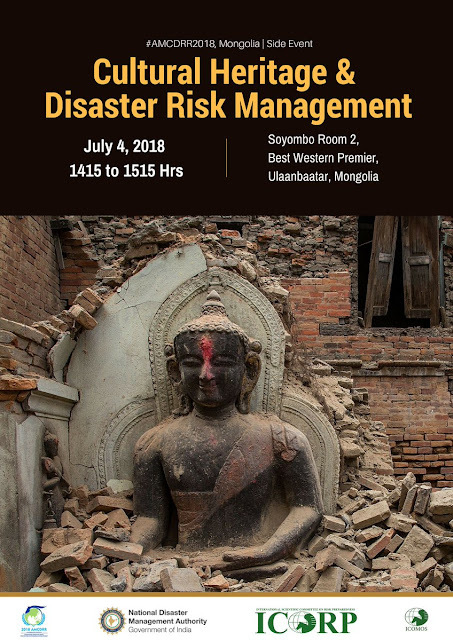 The session discussed cases of post-disaster recovery in the heritage sector after major disaster events, including the Bam Earthquake (Iran 2003), Yogyakarta Earthquake (Indonesia 2006) and Gorkha Earthquake (Nepal 2015). "When it comes to dealing with Cultural Heritage in the context of disasters, it requires a multidisciplinary approach. There is a need to go beyond the physical aspect and look at the impact of not preserving cultural heritage from risk on the social and economic systems," says Shri Kamal Kishore, Member, NDMA, who moderated the session. Disaster risks don't exist in vacuum. They are a result of the interplay between natural hazards and human activities. Only collaborative efforts can address these risks, strengthen resilience and help us move towards a better and safer world. 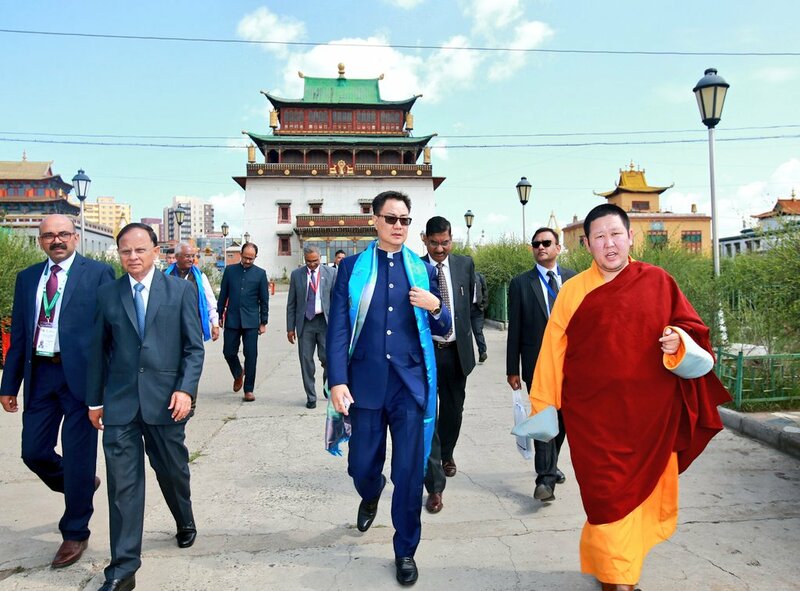 Participating countries at AMCDRR 2018 showed their commitment to this collaboration by adopting the ‘Ulaanbaatar Declaration’ - aimed at preventing and reducing disaster risk, and strengthening the resilience of communities, nations and the Asian region. The roadmap to this political commitment was drawn in the 'Asian Regional Plan 2018-2020', which focuses on the action needed to meet the most immediate deadline of the Sendai Framework - target (e) - which is to substantially increase the number of countries with national and local disaster risk reduction strategies by 2020. Participating stakeholder groups with focus on niche aspects of DRR also pledged voluntary statements of action towards initiatives to reduce disaster risk. The outcomes of AMCDRR 2018 have laid a clear roadmap for the implementation of SFDRR in the Asia-Pacific region. As the region is home to 88% of the world’s disaster-affected population, the better the implementation of the Sendai Framework in this region, the better the overall world picture would be. A short films competition on the theme of 'Preventing Disaster Risk: Protecting Sustainable Development' was organised at the AMCDRR 2018. A 17-year-old from Ahmedabad, Rameshwar Mihir Bhatt's film "Waves of Heat" won in the Amateur Category. Bhatt was felicitated by Mongolia’s Deputy Prime Minister during the closing ceremony.